The second degree is added to create a four-note group that is easy to phrase with and move around. MA+2s lay well on the neck of the guitar, and can be used to reharmonize melodic lines in a readily identifiable way. 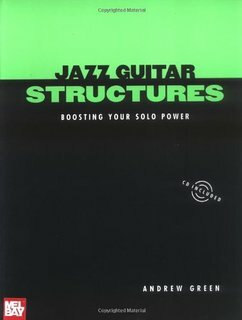 This structure was used extensively by John Coltrane on the tune Giant Steps, and is an indispensable part of the vocabulary of jazz. There is a sense of unity and coherence to this line, due in large part to use of the same structure. It sounds interesting because you get a surprise from the implied motion contrary to the underlying chords. The structures also create tension by introducing #4 on the G7 and #5 on the CMaj7. Resolution by half step between each chord also helps make the line strong. The above melody creates tritone substitutions for the A7 and D-7. Notice that the “wrong” note (F#) on the G7 chord does resolve by half step to a strong chord tone on CMaj7.